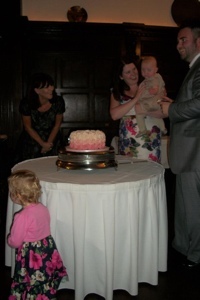 I was excited & nervous at the prospect of making this cake. I could make whatever I wanted & serve it to my nearest and dearest, something I love to do & is one of the things I love most about baking. On the other hand, I felt pressure to get it right & had to be super organised as I had to fit it in with looking after a demanding seven month old. Because I had unlimited choice, I couldn’t for the love of Paul Hollywood decide what to make. I had plenty of ideas but could not settle on one thing. I didn’t want it to have the pomp and granduer of a wedding, however it was the first thing I would make for my daughter & I wanted the standard to honour that. This time I had the pressure of expectation on my shoulders as well. I woudln’t be just baking for fun, but expected to create something lovely. I also had to appreciate that my daughter was only just starting to sleep through the night. She could regress any day & I just cannot function properly without enough sleep (the last 6 months or so have been a bit of a blur). I didnt want to set myself the task of creating anything too ambitious. A google search of lemon cake led me to Martha Stewart’s website & this recipe for white layer cake with lemon curd filling. The recipe is accompanied by a handy (if slightly nauseating) video demo. The mix omits the egg yolks. 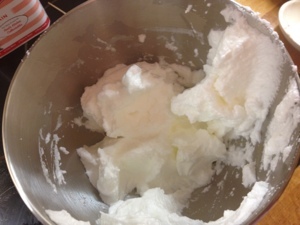 The egg whites are increased & whipped with sugar into meringue before adding the butter & flour. 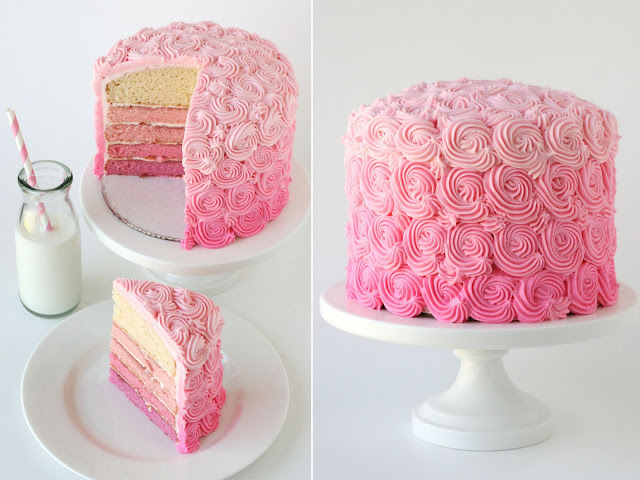 It makes for a moist, light cake, great for this sponge because it’s an ideal base to colour the sponge graduated shades of pink & also to feed 70 or so guests I would need at least four layers. It would be covered in buttercream, so the lighter the better. It is very time consuming but well worth taking the time & effort to grease & line the tins so that they come away from the sponge easily & in one go. It ensures the bottom of the cake is even too. 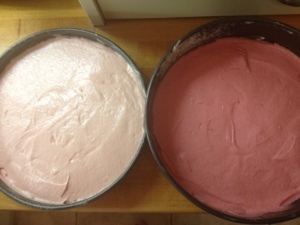 Although they were the same diameter, I had one shallow tin & one deeper tin. Would this mean the cooking time would need to be adjusted for each layer? Should I bake them separately? But I didn’t have the time. In the end I opted for baking two sponges at a time. I figured the sponge in the deeper tin would need slightly longer than the shallow one so I placed it on the top shelf of the oven. 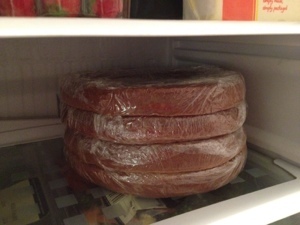 A good tip I learnt from making my Christmas cake, to stop the top from burning, because it requires a longer cooking time, is to place a disc of baking paper over the top towards the end of the cooking time. This sponge didn’t need it in the end. The sponge has a lot of air whipped into it so it was important to try not to open the oven door too soon or it would collapse in on itself. It starts off like a traditional sponge by beating the (room temp.) eggs & butter together then mixing in alternating additions of flour & milk. 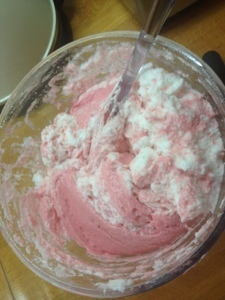 At this point I tinted the mixture with a few drops of gel food colouring (Wilton Rose). 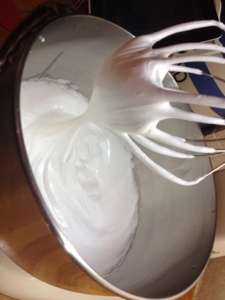 Next, the egg whites are whisked to stiff peak stage. The butter, sugar, flour & milk mix is then carfeully folded into the egg whites, trying to preserve as much air as possible. 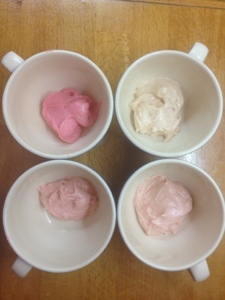 I needed to see the raw batter from each of the four mixes all together so that I could compare & colour them accurately to get the ombre effect. My sister -in-law suggested keeping a tablespoon of each batter mix to one side as a reference. Genius!! I remembered my sis-in-law told me about this icing a while ago and had used it on her Granddad’s birthday cake. I remember it was delicious so did some more research. 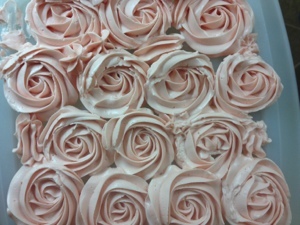 There are several types of merginue buttercream, including French meringue, all made in a slightly different way. Swiss meringue is the easier of the three & involves whipping the egg whites and sugar over a ban marie until the sugar dissolves. 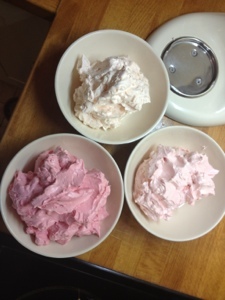 This creates twice as much volume as a standard meringue. Martha actually recommends this icing so I used her recipe. 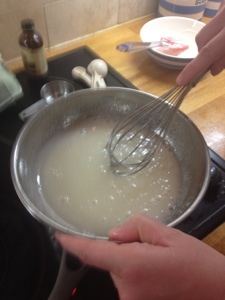 Egg whites & sugar are whisked over a ban marie (pan of hot water) until the sugar has dissolved. This creates volume later. Make sure the bowl doesn’t touch the water or the egg whites will scramble. 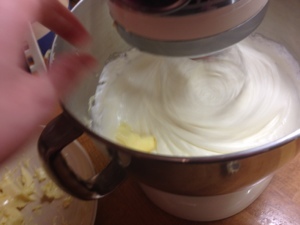 The sugar & egg whites are then transferred to the mixer & whisked to the stiff peak stage, but “still moist”. As this was an American recipe I had to use my measuring cups which I find a bit fiddly. Not so bad for measuring sugar & flour, but when the recipe called for 2 cups of butter it got quite time consuming. In hindsight I should have perhaps converted the recipe into grams & ounces before I started (I have since found a very handy free iPhone app which does this quickly). 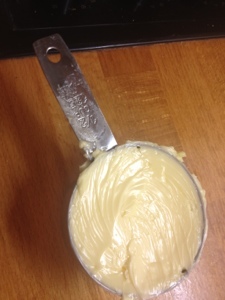 The butter is then added a tablespoon at a time. Now luckily I was warned beforehand (by this fab blog) that this recipe curdles at the beginning. It does eventually come together but I had to stay calm. It did eventually mix. Even though I knew it would come good in the end, my heart nearly stopped each time I mixed a batch. 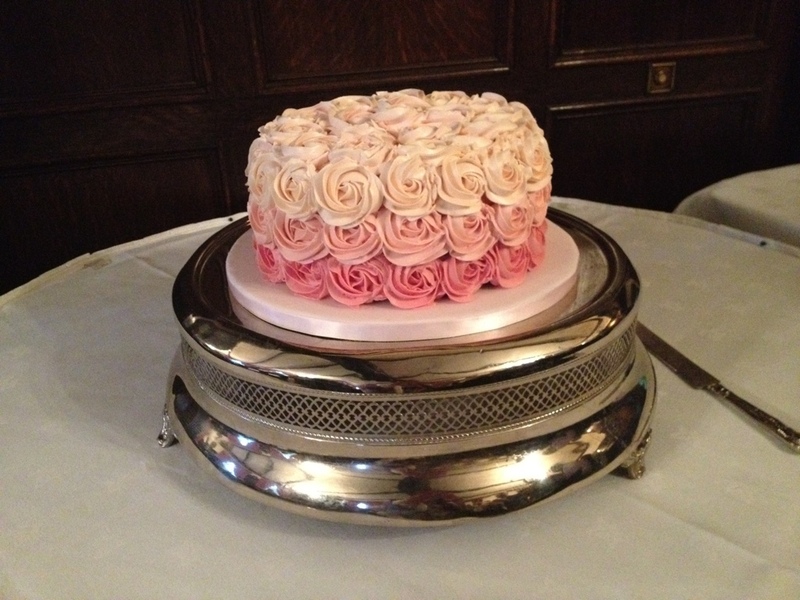 I added the colour (Wilton Rose pink) at this stage. 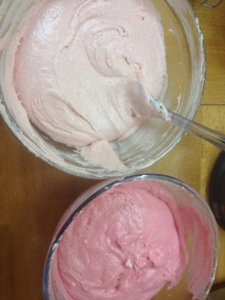 Using the saved batter mixtures as reference, I mixed the icing to the required first shade, removed the amount I needed, then added progessively more colouring to achieve these three shades of pink. 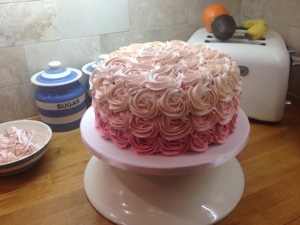 I covered a board with ready-made rolled out fondant icing (using Peggy Porschen’s tutorial from her “Cake Chic” book, see previous cookie post for reference) then covered the sides with pink ribbon. Easy peasy. The sponges turned out quite level &, as I wanted to preserve as much height as possible, I trimmed them only round the edges at the top. 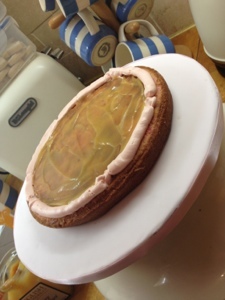 To lighten the flavour & add a bit of interest I spread lemon curd between each layer. I must confess I didn’t make my own lemon curd. I had every intention but on the run up it was just a step too far to get everything ready in time. But I did use luxury lemon curd! 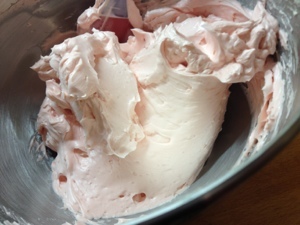 I then piped a rim of icing around the outside to prevent the curd from bleeding into the edges. My crumb coating was rather rudimentary. 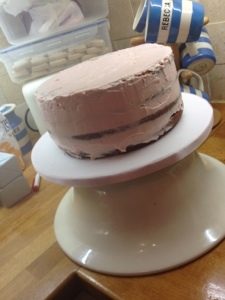 I don’t have a proper turntable & as the cake was already on the board I was afraid to mark it & so didn’t bring the icing all the way down to the bottom. 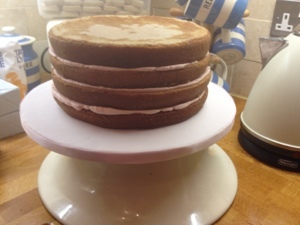 This was not a huge problem though because the final layer of icing just sits over the top of the sponge. 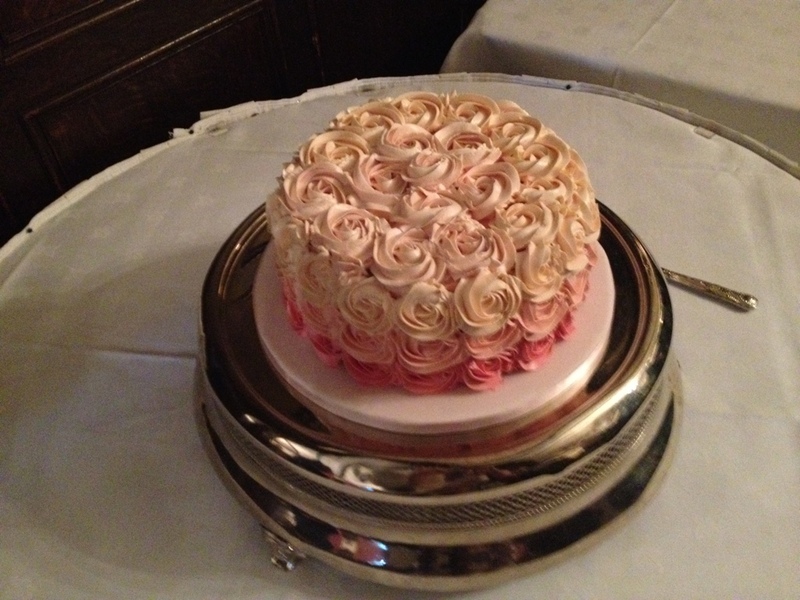 The crumb coating was less about sealing in the crumbs and more about making sure you couldn’t see the sponge underneath the gaps between the roses. I then set it aside in the fridge to harden overnight. As you can see I don’t have a professional turntable so improvised with an upturned bowl! I found the best icing nozzles to create the rose effect were either the Wilton 2D or 1M open stars (these also make a lovely swirl on top of cupcakes). As with the cookie favours, I used the blue disposable piping bags. 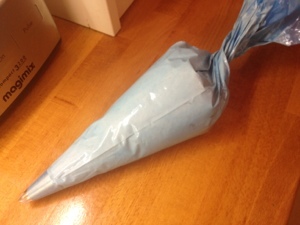 To get the icing into the bag it is easiest to roll down the top then place the bag into a tall glass then use a spatula to scoop & scrape the icing into the bag, then push the icing down so it is snug in the bag to push the air bubbles out. Twist the top of the bag so that you can get a good grip & control of the piping. Before committung to the final version, I had to practice the roses first. These are quite easy. Cara & I had a giggle at a “Cupcakes and Cocktails” class a few years ago where they taught us how to create them. 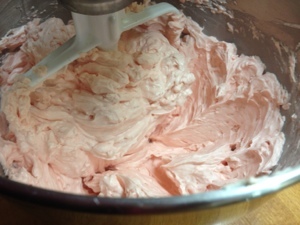 Instead of swirling clockwise as you would a traditional cupcake swirl, you keep the icing flat. i.e. you don’t build it up, & swirl anti-clockwise. Simple but very effective. The icing is also very forgiving. The inevitable spaces between the roses can be filled with a dollop which will blend in & if you go wrong it is easy to wipe off & pipe again. … and here is the final version. Now I just had to get it to the venue unscathed! 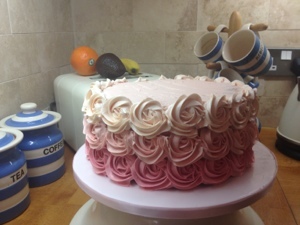 Thank you to my bull-in-a-china-shop husband & very careful father-in-law who took good care of it & did just that (but I did take a spare batch of icing, piping bag & nozzle just in case it required any last minute touch ups!). Here it is in pride of place before it was cut. After all that I failed to get a picture of the ombre effect of the sponge when it was cut! I only got to eat a spoonful as well but the sponge was nice & moist & the buttercream had a lovely marshmallowy lightness to it.